What a surprise when trick or treaters get turnips or Kale instead of candy as Offerings for All Hallows Eve!! “In the olden days, young people in Scotland would go blindfolded into the garden to pull kale stalks and turnips. 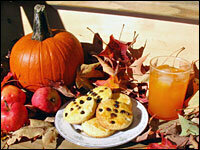 These served as offerings for ancestors and guests as for All Hallows Eve. In the evening by the crackling fireplace, the plants would be “read” revealing signs of the future. Wives or husbands, short and stunted, tall and healthy, withered and old, and so on based on the vegetable. The amount of dirt clinging to the root was believed to indicate the amount of dowry or offering one could expect. The stalks were then hung above the door in a row. Each Halloween visitor was assigned the identity of a vegetable-spouse in turn. Cabbages and leeks were similarly used. So much for the offerings for Halloween being sweet and sugary!! Nuts as an offering for Halloween is another tradition and have been used for magic since Roman times. Some Scottish and northern English people believed nuts were so powerful that sorcerers called their October 31st celebration “Nut Crack Night”. Halloween is an American Holiday and often uses apples for an offering for Halloween. Things such as popcorn balls, homemade cookies and fruits were given as Offerings for All Hallows Eve, before store-bought candy! Apples and nuts were seen as powerful “fortune-telling” or divination tools in old England. Celtic folk used them in such in their Halloween divination games for centuries. There are some Scottish, Irish and British men and women from the northern parts of England who still celebrate All Hallows with apples and nuts. And did so throughout the heyday of Guy Fawkes. Also known as Firework Night, it is an annual commemoration observed on 5 November. Its history begins with the events of 5 November 1605, when Guy Fawkes, a member of the Gunpowder plot, was arrested while guarding explosives the plotters had placed beneath the House of Lords. The night of October 31 was known in parts of the British Isles as “Snap Apple Night”…the name of this Halloween Traditions came from an old game played by tying the player’s hands behind his back and having him try to bite an apple suspended from a string. Like their English ancestors before them, Americans used apple dunking to find who will marry first. Whoever could snag an apple from a big bucket filled with water, hands tied behind the back, would be wed soonest. And don’t forget to honor your ancestors as the veil is the thinnest on All Hallows Eve and they will join you for the celebration!!! Whatever you choose as an Offering for Hallows Eve or Halloween, STAY SAFE and have a Happy Halloween. All Hallows Eve, halloween, halloween traditions, offerings for halloween, trick or treat. Bookmark.